Amir-John Haddad was born in Freiburg Germany in 1975 and comes from a Colombian and Palestinian background. He was raised and educated in Germany and lived for a short while in Bogotá (Colombia). Since childhood he hasn’t stopped travelling and has been always in contact with music. His family environment taught him how to play music by ear. He learned music, his future language, by oral transmission and was only 7 years old when he officially started studying the Flamenco guitar after learning Arabic oud at home by the hand of his father and first teacher Rimon Haddad. 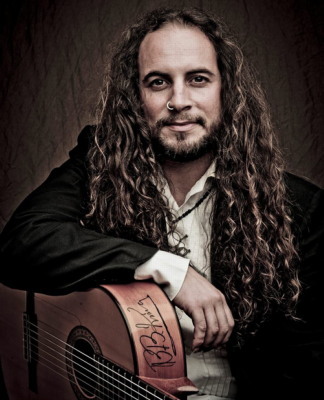 Years later in 1997 Amir decided to move further south to live and study guitar in one of the most important birthplaces of Flamenco, Jerez de la Frontera (Andalucía-Spain). As he says: “I left Germany with my guitar and a suitcase full of illusions & expectations! I wanted to learn this art form in a traditional way by oral transmission in the streets meeting the artists and make my experiences through living with the people and share many moments of “juerga” (Flamenco jam all night long)!” During his period in Andalucía he was a disciple of famous guitar maestros like Pepe Justicia and Enrique de Melchor. This experience has been very important for his career. In 1998 Amir moved on to Madrid to find new frontiers and keep on growing professionally as a musician and find a place in the music scene, “I wanted to make a living out of what I liked the most! I couldn’t imagine myself in the future without playing my instrument!” He played in famous Flamenco Tablaos such as Las Carboneras, Café de Chinitas, Corral de la Pacheca, Casa Patas etc. It was in Madrid when Amir was invited to join and play with the legendary and famous Spanish World Music Band Radio Tarifa. Amir was the official oud, bouzouki and guitar player for almost ten years and made many world tours through a large number of countries and cities. In 1999 he won the first prize for original musical composition at the national “Certamen de Coreografia de Danza Española y Flamenco” at the Teatro Albeniz in Madrid.